‘THE ONE WHO FELLED MUGABE’ Zimbabwe’s vice president RTD Gen Chiwenga has been flown back to Zimbabwe from hospital in South Africa. 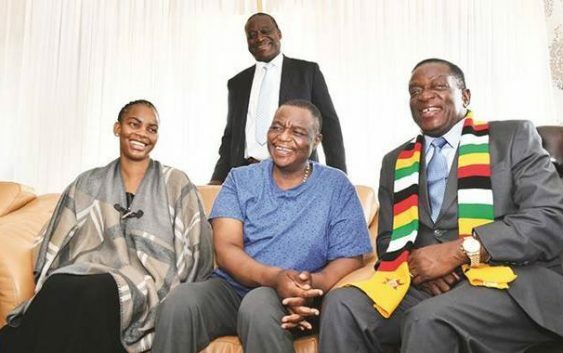 Yesterday the president Emmerson Mnangagwa, paid the frail looking Vice president, a visit at his house , where he met Chiwenga and wife Marry, and spent two hours with them talking about nothing important except reminiscing over their time in prison during the war time. More news to follow. Presidential spokesperson George Charamba said Mr Charamba said Health and Child Care Deputy Minister Dr John Mangwiro, who travelled with VP Chiwenga to South Africa, briefed the President that the VP needed time to rest before he resumed the demanding duties of his office. Explaining VP Chiwenga’s condition, Mr Charamba said: “The VP had developed acids in his stomach that were reaching the small intestines. It was very bad. I think his system was producing too much of hyaluronic acid in the stomach. CHAMISA vs KHUPE MDCC-T LEADERSHIP feud is still a major issue in parliarment.